The Powder Checker Comb simple, easy-to-use powder thickness gauge measures the thickness of applied dry coating powder ...before it's been cured! 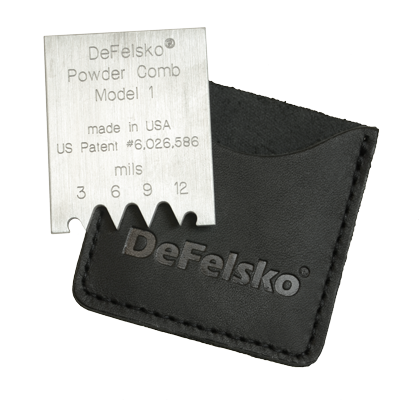 Check Powder thickness with the Powder Checker Comb before curing to help insure correct cured film thickness the first time through the line. Avoid stripping and re-coating which can cause problems with adhesion and coating integrity. of the teeth rest firmly on the substrate. Note – Most powders cure to approximately 50% of their dry thickness. Marks left by the gauge may affect the characteristics of the cured film.